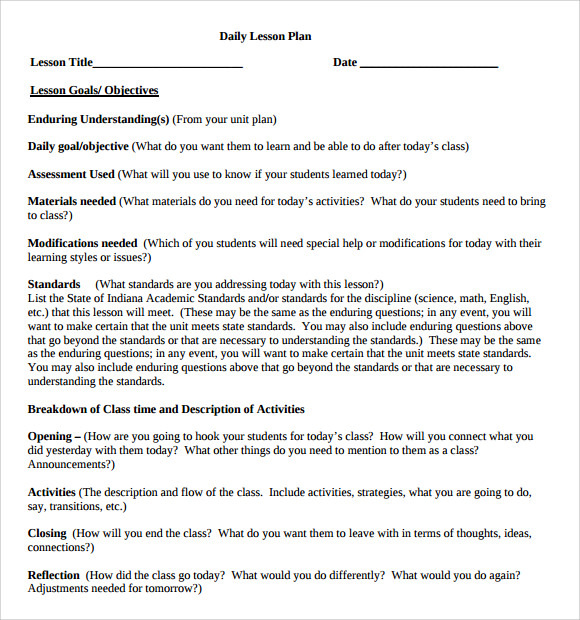 The daily lesson plan template is useful in planning the Sample Lesson Plan in advance for the whole week. 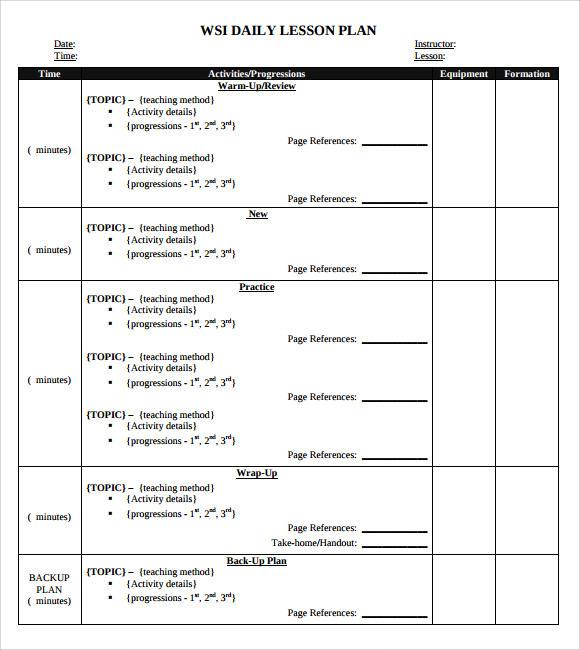 This is a typical lesson plan but in the form of template to make it more professional and time manageable. The examples in the website template are free. It can be downloadable and printed too. 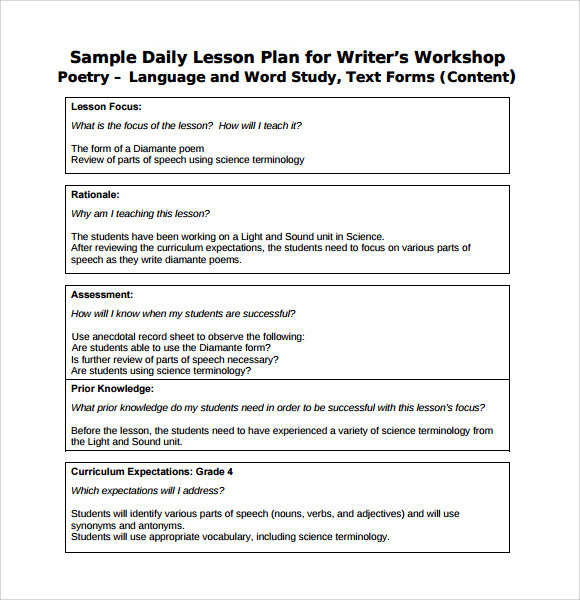 The Sample Lesson Plan will be presented in the form of Microsoft Word or PDF. 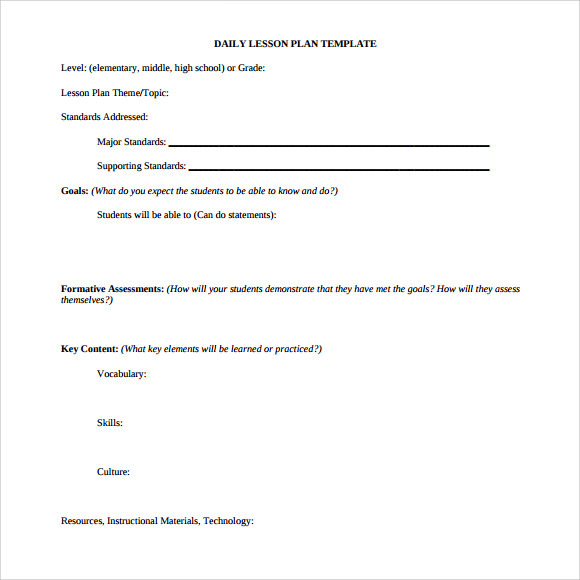 After selecting the preferred lesson plan format and complete the details, it can now be print accordingly. 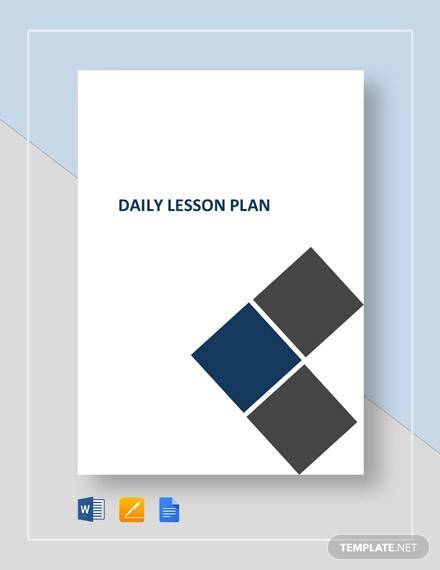 The daily lesson plan template is a visual tool makes every lesson plan achievable and accessible. 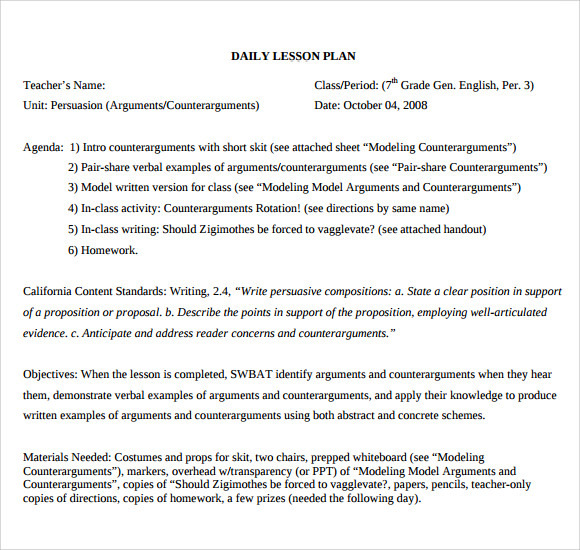 This sample of daily lesson plan template is meant for students from the middle school. It begins by addressing the major concern in the standard of a student and then comprehensively lists down the expectations of a teacher from his student. For better understanding of the student’s overall performance, the teacher can give ranks and numbers in various subjects like vocabulary, skill sets, and subjects. 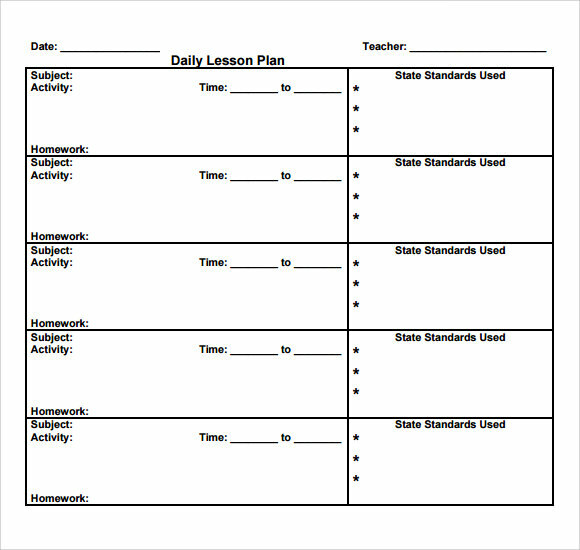 This sample of blank daily lesson plan template has a simple format and begins with the name of the teacher, subject and grade of the student. It then proceeds to list down the general objectives as well as the specific objectives of the lesson. Various topics covered under this sample include closing, evaluation, materials, technology, assignments and extenders. 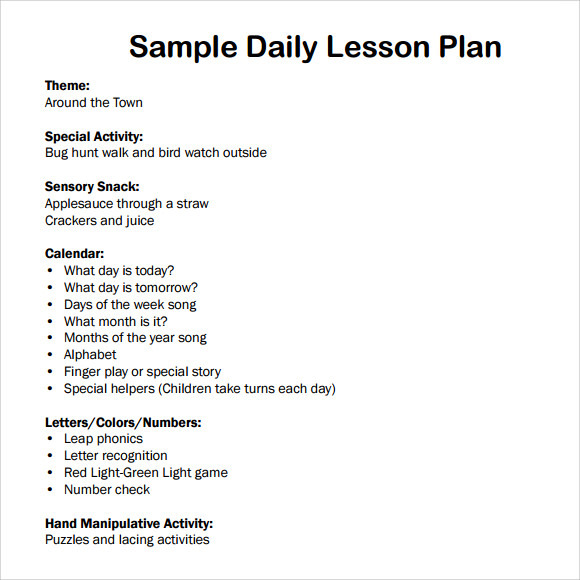 This sample of daily lesson plan is typically meant for a toddler in a pre-school stage. The theme makes a comprehensive list of the toddler’s daily activity for an entire calendar month. It also aims to keep a track of all the activities which a child is expected to perform like craft, hand manipulation activity and creative activities. 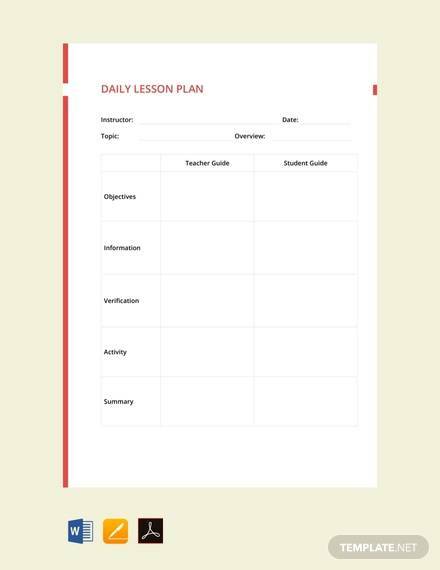 This sample of free daily lesson plan template is a simple template that aims to list down the child’s daily lesson in a subject wise manner. This template divides the activities in various sections for each and every subject. There is a tab for allocating time for each subject which would help to stream line the activities in a better manner. Why Is It Important For Teachers To Plan Lessons In Advance? Planning a lesson in advance helps a teacher to conduct her lesson in an orderly manner. A good lesson plans helps to build a sequence in the mind of the students whereby they are aware in advance about the course of their syllabus. It builds confidence in the teacher as they are able to understand that their teacher is putting in a lot of hard work for their well being. Systematic planning helps to reduce frustration and reduces time delay in lesson execution. What Are Some Of The Effective Strategies For Effective Lesson Planning? Think the lesson in your head and device a make a roadmap of what you wish to accomplish in the class. You can also write the plan out for better results. Plan to answer all types of questions that might come across to you. Think from the child’s point of view. It shall give you a better idea about lesson plans. Remember you have a time constrain. Within the limited amount of time you have the twin task of completing your course and also of making it enjoyable. Choose the best delivery method as per your plan. If you are taking a science class a practical presentation may as well prove to be very helpful. Plan your lessons well and build different end points into your lesson so that you can finish it well within time.